One of the first things a knowledgeable restorer of vintage electronic gear does prior to plugging in a newly acquired piece of hardware is to replace all of the original paper capacitors. Those things notoriously lose the internally contained smoke that makes them work soon after power is applied. Episodes of conflagration often ensue. According to Mac McGregor, the typical shelf life of a paper capacitor (and some mica and ceramics back in the day) is about five years. In that time the insulation resistance can drop from 5000 MΩ to less than 2 MΩ. Ohm's Law quickly reveals that with used across a 300 V plate bias supply circuit, the leakage current can be 0.15 mA, and dissipate 45 mW of power. Considering the number of such connections in products like the RCA Victor Model VHR-307 Home Recording Phono-Radio Combination, the current and power can add up quickly, and the generated thermal noise can get significant. These articles, while apparently an electronics serviceman saga, is actually meant to be instructive to readers, many of whom were service shop owners or employees. There are a couple YouTube videos of people demonstrating the 'cat's eye' tube used to indicate a peak in the capacitance bridge adjustment. Mac was so busily engaged in what he was doing at the workbench that he actually jumped when he heard the voice of Barney, the second banana of the shop, who had entered quietly and was standing behind him. "So! You sneaked out and bought something new!" Barney was saying accusingly as he leveled a finger at the impressive little black instrument, bristling with push-buttons, dials, switch knobs, a magic eye tube, and a large meter sitting on the bench surrounded by all sizes and shapes of capacitors. "What is it?" "A Sprague Model TO-6 Tel-Ohmike Capacitor Analyzer," Mac answered. "The other day I replaced a 0.1-μF coupling capacitor in a tape recorder with one from our stock and found the new one had less insulation resistance than the one replaced. I tried three more of our capacitors, and every one showed objectionable leakage, but a fourth was fine. Right then I decided we needed an accurate method of evaluating capacitors we planned to install in critical locations. The fact that a capacitor is unused obviously does not mean it is good. Moreover, many surplus capacitors can be purchased today at such tempting prices that they represent bargains - if we have a means of separating the sheep from the goats. This little instrument is just the ticket for telling us all we need to know about surplus capacitors or the ones we get from our jobber. "It measures capacitance from 1 pF to 2000 μF, and the applied voltage is low enough that capacitors rated at 3V can be tested without damage - an important point with capacitors designed for transistorized equipment. The power factor and leakage current of electrolytics can be accurately measured at their exact rated working voltage. Finally the insulation resistance of paper, ceramic, and mica capacitors can be read directly on a meter with two ranges: one up to 10,000 megohms at 30 V for low-voltage capacitors and the other up to 50,000 megohms at 150 V for higher voltage types. Incidentally, those leaky paper capacitors of ours have insulation resistance of less than 2 megohms, while they should have a minimum resistance, when new, of 5000 megohms. This is according to data given in the TO-6 operating manual as to what constitutes minimum insulation resistance for all types and values of paper, mica, silver mica, ceramic, oil-filled, subminiature capacitors, etc." "We must have got a bummer batch of 0.1-μF capacitors, huh?" "I doubt it. Those capacitors were probably OK when new but simply deteriorated in the bin. I have no idea how long they've been there. We don't use many 0.1-μF 600-V units any more, and I have the bad habit of ordering new paper capacitors when anyone type is running low and dumping the new ones in on top of the old. Then I use the new ones off the top of the pile and leave the old ones down at the bottom; and I do this over and over. We're going to quit that." "You think paper capacitors go sour on the shelf?" "'Nothing good nor bad lasts a hundred years,' the Spanish say. All things deteriorate with time - except service technicians, of course! At any rate, I became curious about the shelf life of several items we use regularly and dashed off letters to capacitor, battery, tube, and solid-state manufacturers asking them for information as to the shelf life I could reasonably expect from their products, what conditions affected shelf life, and what recommendations they had regarding storage. Returns are still coming in, but I already have a good response from capacitor and battery manufacturers. After all, they know that customer satisfaction and confidence comes from installing components when they are new and fresh. Trying to use an over-age, gone-sour component breeds dissatisfaction, no matter how unfair that feeling may be." Shelf Life of Capacitors. "Okay, so what have you learned about capacitors?" "I've learned the normal shelf life for paper tubular capacitors used in TV/radio is about five years, as is the normal shelf life for micas (both dipped and molded) and small ceramic capacitors. The decrease in insulation resistance with time takes place chiefly in the dielectric material. Heat and moisture are great villains in this regard. Every effort is made to seal moisture out of the capacitors, and modern techniques do a good job of this; but if the capacitors are exposed to temperature cycling under conditions of high humidity, some moisture is eventually bound to penetrate the seals and degrade the insulating quality of the dielectric." "Then these capacitors should be stored away from heat and moisture." "Right. As one capacitor manufacturer wrote me, 'I suppose that one way of looking at it would be for you to keep the capacitors under conditions similar to that under which your wife would keep spices - not near any heat, such as a stove or radiator, and as dry as possible.' You and I can believe this because we both know that when we get a radio in for service that has been stored in an attic or basement, we are certain to find several leaky capacitors in it." "How about dry electrolytics? Should they be stored under the same conditions?" "As far as keeping them away from high temperature, yes; but here we are not so much concerned with keeping the moisture out as keeping it in. Let me explain. A dry electrolytic really might be called a 'damp' electrolytic because the electrolyte inside it is in the form of a moist paste. The actual dielectric is a very thin oxide film that normally forms through the combined action of an applied voltage and the chemical action of the electrolyte. The anode constitutes one plate of the capacitor, the electrolyte forms the other. Therefore the drying out of the electrolyte destroys the capacitor, and the presence of heat speeds up this drying process. "Manufacturers seem to agree that the normal shelf life for dc electrolytics is one to two years. However the drying up of the electrolyte is not the limiting factor here as much as is the gradual deterioration of the dielectric film under the eroding action of the electrolyte when no polarizing voltage is present to maintain that film. The life of an electrolytic capacitor on the shelf can be materially extended if a polarizing voltage is applied to it through a current-limiting resistor every few months. Heat increases the chemical action of the electrolyte on the oxide film under storage conditions and shortens the normal shelf life." "What happens if the capacitor is stored at extreme low temperatures?" "The series resistance goes up and the capacitance goes down due to ionic immobility because of the freezing of the ionizing agent. Capacitors that have been out of service at extreme low temperatures react as though open circuited at first but start returning to normal with the temperature rise of the equipment." What About Batteries? "Okay, now tell me about the shelf life of batteries. 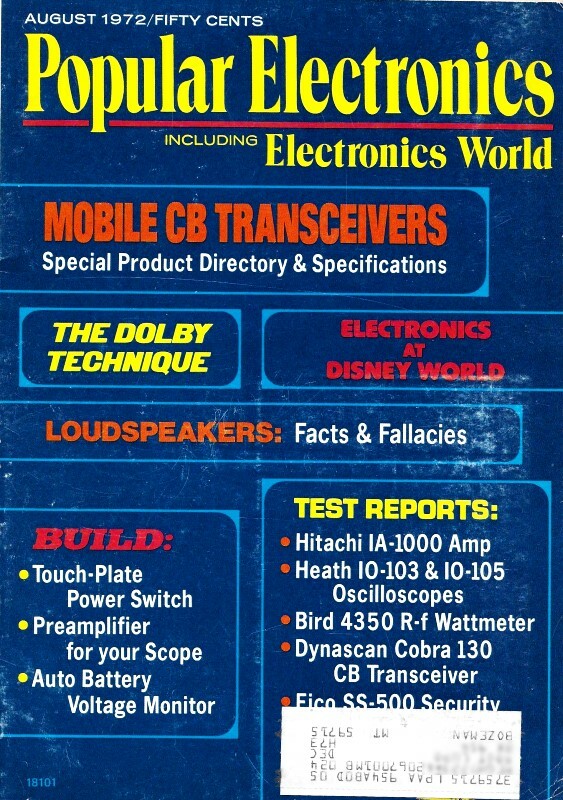 Transistorized equipment has made this an important subject." "I'm indebted to Union Carbide, maker of Eveready Batteries, and to RCA for the information I have on this subject. Union Carbide defines the shelf life as the period of time, at a storage temperature of 70° F, after which a given battery retains 90% of its original energy content. Shelf life is reduced by high temperatures because of wasteful zinc corrosion and side chemical reactions within the cells and because of moisture loss from the cells through evaporation. The shelf life of a battery stored at 90° F may be 1/3 that of one stored at 70° F.
"RCA has conducted some interesting tests on the effect of temperature on shelf life of carbon-zinc cells. For example, an A-size carbon-zinc cell stored at 70° for 24 months retained only 50% of the rated capacity, but cells stored at 45° F and 0°F retained 70% and 90%, respectively, of their rated capacity. Other tests showed carbon-zinc cells stored at 48°F were in better condition at the end of five years than those stored at 104°F at the end of one year. "UC says the shelf life, as defined previously, of silver-oxide, mercury, or alkaline batteries is one year. The shelf life of carbon-zinc batteries is slightly less than that. Other types of batteries mentioned do not benefit as much from cold storage as do the carbon-zinc cells. "RCA, on the other hand, while agreeing on the shelf life of silver-oxide cells, finds mercury cells have a shelf life of two years and that alkaline cells have a shelf life almost as good. RCA further states that the shelf life of mercury cells can be extended by storing them at lower than room temperature, provided suitable precautions are followed. Since both companies concur in these precautions, let me list them: (1) Don't handle frozen batteries any more than necessary and be gentle with them to avoid cracking the internal and external seals which may become brittle at low temperatures. (2) Allow the cells to reach room temperatures in the containers in which they are stored to avoid excessive condensed moisture, which will generally destroy the jackets and increase electrical leakage. (3) Do not put the cells into service until they have reached room temperature." "How about recharged primary cells? Is their shelf life as good as it was originally?" "Definitely not. RCA says such recharged cells have a very poor shelf life and should be put into service immediately after recharging." "Well," Barney said, "this certainly has convinced me that capacitors and batteries should be purchased from a source that moves these items rapidly and keeps a close tab on how long they have been on the shelf. By the same token, we should buy in small enough quantities that they will not be long on our shelves. And we should work on a first-in-first-out basis. But now tell me about the tubes and transistors." "I'm afraid that is going to have to wait," Mac said, starting to put the capacitors he had finished testing back into their bins. "I haven't heard from all the people I wrote to in those fields yet, and it is high time we got to work. But I promise that someday soon we'll talk about the shelf life of tubes, transistors, IC s, etc."